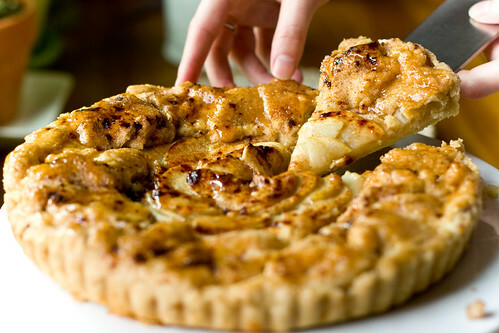 I know it’s not fall, but I saw a photo of an apple tart a few days ago and have been craving it ever since. I just had to have one. If you’re looking for an easy, no-fail dessert, this is for you. It’s perfect for a special after dinner dessert, or for company, or as a gift for the next host or hostess that invites you into their home. It’s straightforward, pretty, travels well, and can be served cold, room temperature, or hot. And did I mention it’s yummy? If you haven’t made your own pie crust yet, this is the recipe to jump in with. It’s a basic pate brisee, which is a standard flaky crust made with flour and fat. I like to use a mixture of half shortening and half Earth Balance margarine, but you can use all Earth Balance if you prefer. I used granny smith apples because I like a tart tarte, but if you’re looking for something a little more mild, give golden delicious a try. Any apple that keeps its shape during baking will work, and you can even mix and match varieties to your liking. A tarte pan isn’t required. Feel free to use a regular pie tin. 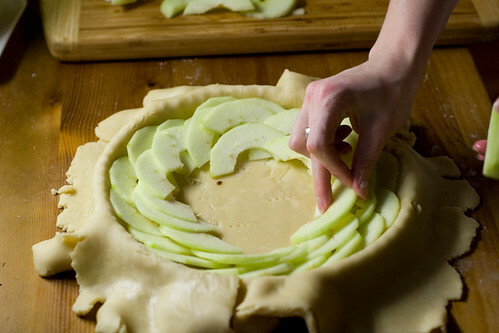 Or, make a rustic galette-style tarte by simply piling up the apples in the middle and folding the edge of the dough over the top. I was about to do it this way myself, but I couldn’t withstand that pretty, polished, fluted tin. What can I say? I’m easily distracted by shiny things. Pulse until the mixture looks like wet sand, with pea-sized lumps here and there. 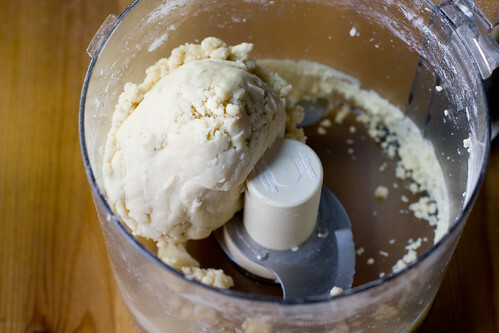 Slowly drizzle in water while running the machine until the dough forms a ball. If in doubt, add less water as opposed to more. 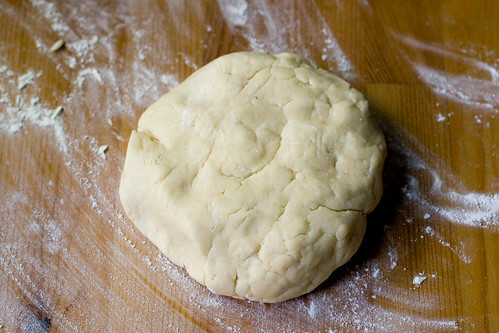 Turn out the dough onto the counter and press to form a disc. Cover in plastic wrap and refrigerate for at least 1/2 hour. Preheat your oven to 400º F. Juice your lemon and place the juice in a small bowl. Peel the apples, brushing them with lemon juice as you go to prevent discoloration. Slice the apples in half and core them. 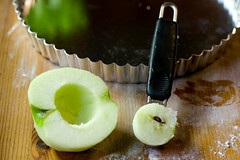 I use a 1 tsp measure to core my apples, it works just like a melon baller would. Don’t forget to brush the insides with lemon juice, too. Roll out your pate brisee on a sheet of parchment or wax paper. 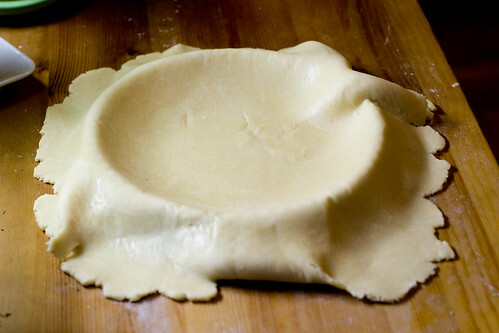 The dough should be 1/8″ thick and should be larger than your tart tin on all sides. 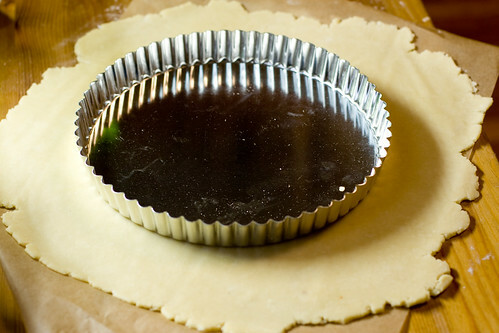 Invert the dough (using the parchment as support) over the center of the tart pan. 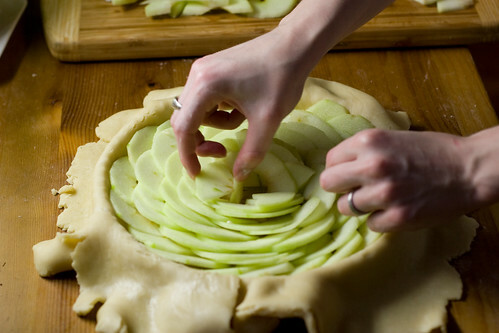 If you’re making a pan-less galette, skip this step and move on to arranging the apples. Gently work the dough into the pan and start arranging your apple slices in rings, starting at the outside and working in towards the center. It won’t really matter what it looks like once it’s baked, so don’t freak out about aesthetics. Just make sure to jam a bunch of apples in there, since they’ll cook down as it bakes. The color is off, because at this point a huge thunderstorm had rolled in and messed up my lighting. The humidity and heat even wreaked the dough a little, but it still turned out just fine! If your dough gets too warm it may break apart (like mine did), but just mend it and soldier on. You won’t notice after it’s baked. Once the apples are all in there, coat the top with the sugar and spices. Fold over the edges of the dough towards the center (they won’t cover the top completely–I don’t have a picture of this step because by this time the storm was so bad I couldn’t photograph anything at all). Brush the entire tarte with melted Earth Balance and sprinkle with more sugar. Pour any leftover earth balance over the apples. 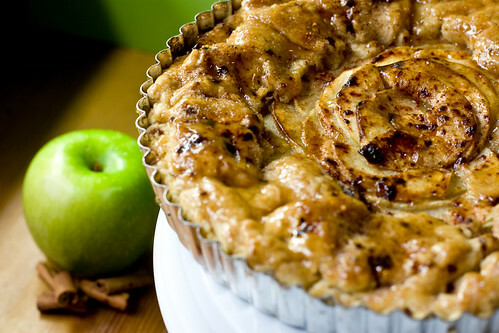 Bake at 400º F for 45-55 minutes, or until the tarte is golden brown and the apples have color on them. Glaze with warmed jam. Let cool most of the way before slicing. 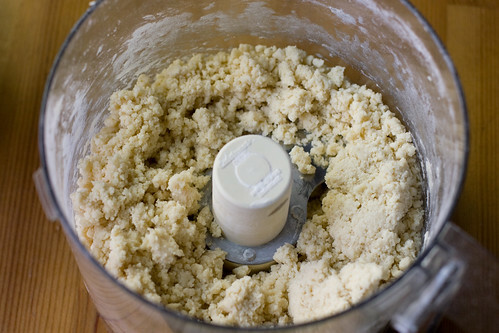 *A food processor isn’t required, it just makes your job a lot easier. 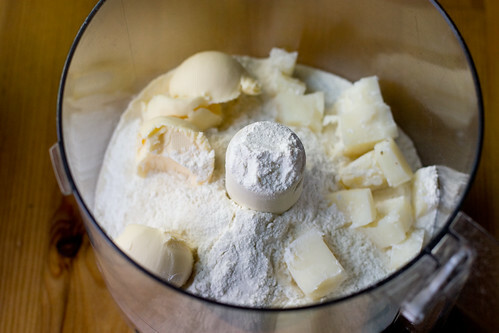 If mixing by hand, be sure to work the fat all they way into the dough before adding the water. Looks absolutely delightful. 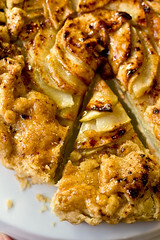 I just cooked with apples tonight for dinner, and this would have been perfect for afters. Thanks for the detailed step-by-step; the end product looks so elaborate and elegant but the process is so simple! I would love to try this recipe. I also really like your idea of presenting it to the host/hostess — plus, that way you can ensure there be no vegans deprived of dessert at the party!! All of my attempts to make a vegan pie crust over the years have failed miserably. This looks so delicious, I am going to give it another try. Thanks for sharing your recipe! WOW! This has such amazing presentation! I’m going to have to make this for my brother next time he comes home. Thanks for the awesome recipe! *drool* Mmmmm, this looks delicious!! Mmm, each shot looks yummy. I especially love the second to last one where the apple slices in the crust are fanned out like cabbage leaves. I love apple pies! Yours look incredible delicious! Great. Now *I’m* craving an apple tart. I absolutely love Granny Smiths! That tart looks amazing and your photos are exquisite as always! Oh my gosh! Looks so delicious! Your photos are amazing as well! Breath ! Note to self …. must make …. must make!!! That looks delicious. It almost looks as if there’s a top crust, but I guess that’s just the seasoning and stuff…wow, I wish I could have a slice now. Is it possible to use the same crust for a quiche? Hmm, I don’t know what the best crust for quiche is, but I think this would work (even if it’s not ideal). we bought the ingredients to make this tomorrow! Fab photos! That looks delish! This is so beautiful. I would have had a hard time cutting into it. This is probably the best food website there is. Thank you! The pictures are fantastic and so are the explanations! I made this today, and it is yummy! Thank you ever so much! I’ve noticed that you use ‘Earth Balance’ in your baking, I think this must just be available in the USA. Do you think Pure (http://www.puredairyfree.co.uk/) is roughly the same thing? I’ve never used it myself, but yes, the products look similar to each other. Glad the tart worked out for you! I made an apple tart recently too. It felt weird to be making such an autumny dessert in the heart of spring glory. But, darn it, it was really delicious! Yours is beautiful, and thanks for the crust recipe. I love making crusts, and am always happy to try out a new recipe. Beautiful cake! I can only imagine how wonderful it tastes. You make everything look so easy! Beyond Beautiful! I love your step by step pics. It seems really difficult but you make it look easy. The end result is gorgeous! I’ve never made apple pie before…I’ve never even made pie before! But this looks so yummy and simple, I think I’m going to try it. Thanks for always posting such great recipes and step by step instructions. I love your photos! What type of camera do you use? this looks absolutely amazing. i read your blog a lot and rarely post but i have to say you make some amazing food and take really good pictures. i cant wait to try this! and the crumb cake which also looks incredible! keep it up, if you release a cookbook ill buy it! Great as usual! Please tell me how do you take it out from the form to the clean plate? Made this tart this weekend. It was beautiful, simple, and delicious. I thought it was so beautiful, in fact, I took a picture and made it my Ravatar. :o) Link attached. That sure does look yummy. You blog is soo coooooooollll……l. and colorful. i made this a few days ago – it was so easy and so delish! thanks!